I’ve been a bit on the neglectful side recently, but I’ve still been cooking. On Monday we had our first BBQ of the year (hooray!) as we’d already planned to have sausages for tea and it would have wasted the weather otherwise. Nothing quite like a good quality meaty sausage in a bun with home made apple chutney! On Tuesday, A Man was out for dinner. As you may or may not know, my little brother is a fishmonger and in February he bought me a load of sprats which he proceeded to fillet and which have been sitting in my freezer ever since. I simply grilled them for a couple of minutes and ate them with lots of salad, beetroot chutney (thank you A Man’s nan!) and horseradish sauce. Yum! Having been at work on Tuesday, I wandered round the store to check out the reduced items, went slightly mad and bought 3 gammon shanks. 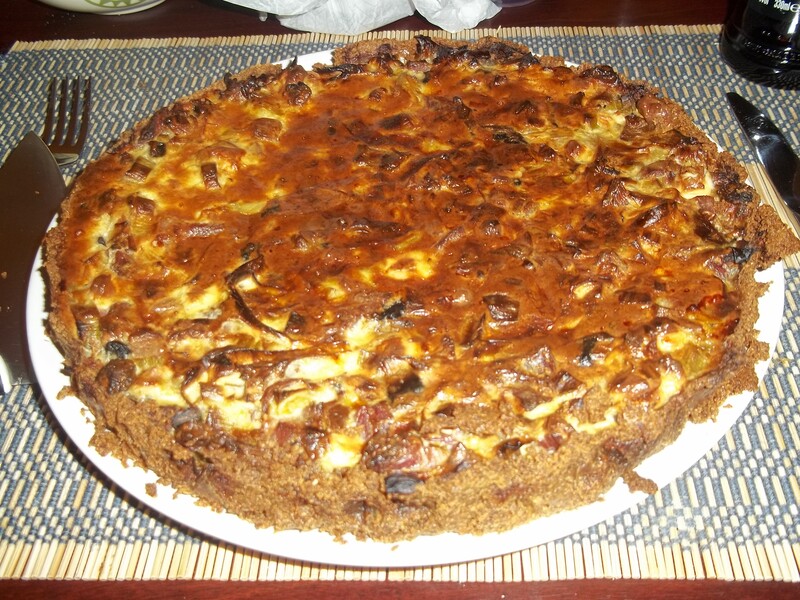 As the weather’s been fantastic, I had been planning to make a quiche as it can be eaten hot or cold and is great with salad so I decided to make this for Wednesday’s dinner. I cooked up the gammon exactly the same as when I made ham and lentil soup and stuck about 2 thirds of the cooked meat in the freezer. I also made several pints of impressively gelatinous stock, which has been frozen. If you don’t have gammon shanks (or can’t be bothered to cook them) then this recipe would work just as well with bacon lardons or thickly chopped ham. Besides, you can stick whatever you like in the quiche – broccoli is one of my favourites. Fry the leeks and mushrooms in a little olive oil on a low heat until starting to go soft. Add the gammon. Roll the pastry into a 10-12 inch flan dish and blind back at 180OC/350OF/Gas mark 4 until starting to go crispy. Spoon the leek mix into the pastry case so that it is evenly distributed. Whisk the egg with around 4 dessert spoons of fromage frais. Crumble in the feta and season with the salt, pepper and herbs. Pour over the leek mix and stir slightly to distribute the leeks throughout the custard. Bake for around 20-30 minutes, until the custard has set and is browned on the top. 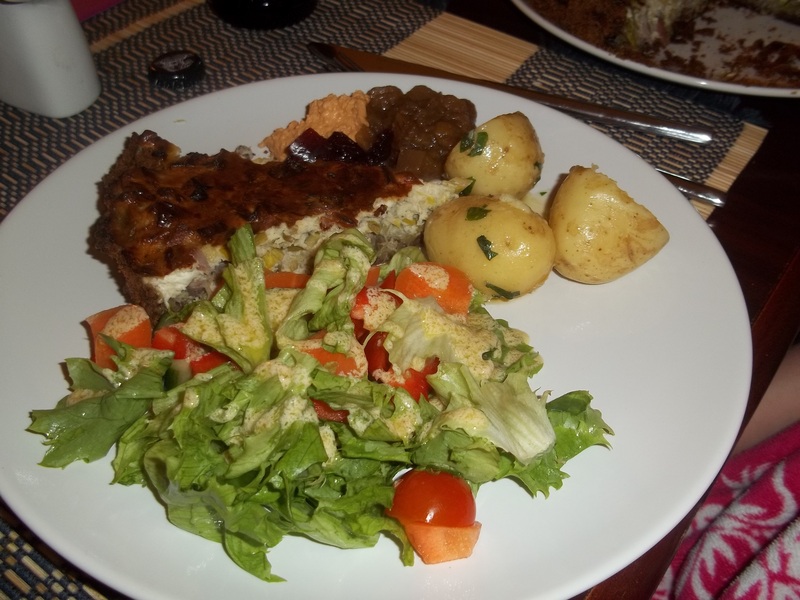 Serve either warm or cold with salad, chutney and new potatoes. Christmas. Let’s face it, it’s all about fruit and booze.